It occurred to me recently that every time I offered someone a lift in my car, I was actually asking them to subconsciously take part in one of my dance sessions. To give you an idea of what you are likely to face if you travel in the back of one of the TRS teachers cars, you will probably intertwine yourself with a few hula hoops (eager passengers have even have a go at hula hooping before getting in! ), you’ll need to put the giant teddy bear on your lap in an effort not to squish him, you can rest your feet on the pile of bean bags in the footwell and if you are chilly then you can wrap yourself up in some of the soft ‘liquid gold’ material. Whilst you are surrounded by various props and teaching aids, you can also enjoy the ever changing music that may pop up on the iPod shuffle, it could be anything from Glenn Miller to One Direction, to Nursery Rhymes….you name it, we have taught a dance to it! So why are these props invaluable to our classes? Regardless of age, props are an exciting addition to a dance class, particularly during creative sessions. 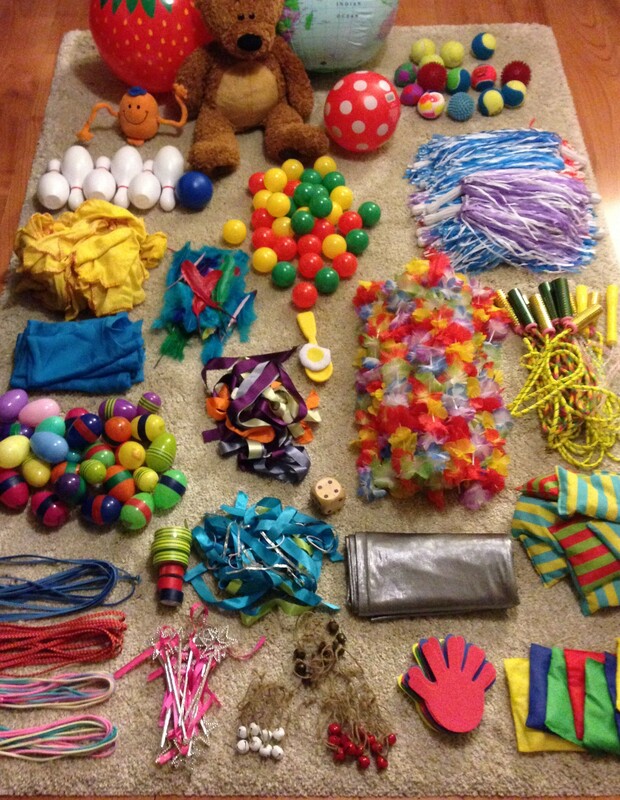 Props bring colour and new dynamics to a session and help to encourage participants to move in a different way. In Active Armchairs classes I often use feathers for creative tasks and many participants find the colours and texture brings a new element to their dance experience. There is no better place to store our teaching aids than in our cars. Only last week I was called upon to cover an Active Armchairs session last minute due to sickness, having been teaching in a primary school I wasn’t prepared for this. However, with my office (my car!) nearby I knew I had all the teaching aids I needed to adapt quickly! Our cars are our office. They get us from A to B…and then onto C, D and E throughout the day. Without time to pop home to grab props for the next class, everything we could possibly need to teach ages 2 to 102 are at our disposal. Many of the TRS teachers are always on the go, replying to emails and eating lunch whilst parked outside the next venue…a mobile office! All in the name of dance!